my wife is the one who gave me the 3D prints of the modelmaking friends. Or if you want to know it so well, next to the mine car in the picture. Helmut, Great accomplishments in modeling. after heat-free in the workshop and the family-related break, it can finally go on. For the rehearsal I started with the character of mine and set it up for a rehearsal in the Cakebox model. The pit light is already tested and the connection is made via M1,4 threaded bushings in the legs. So the connection can be completely unobtrusive but very reliable. Visitors can come and wait for their painting and design. The figures are 3D prints of real model trains that I personally know. Of course they were designed to pit suitable. During the search I had made sure that the clothing was ever suitable. So all needed really only a pit helmet of 2K plasticine was modeled. One had unfortunately only a top with short arms, and this could be modeled with the 2K plasticine to a jacket around. Now the primer follows. The wires are also in this case for the pit lights what is spent on the safety of some. 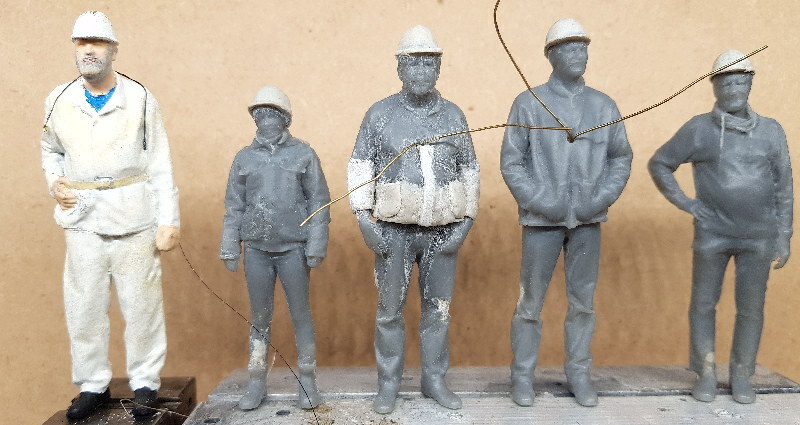 All figures have M1.4 mm threaded bushes in their legs, in 2 figures the figures are again pierced with extra-long drills and 0.5 mm brass wire was drawn in. The 0.5 mm wire is shortened and then the fine connection wires of the SMD Led's can be easily soldered to it. Helmut, your helmets and clothing modifications came out well. 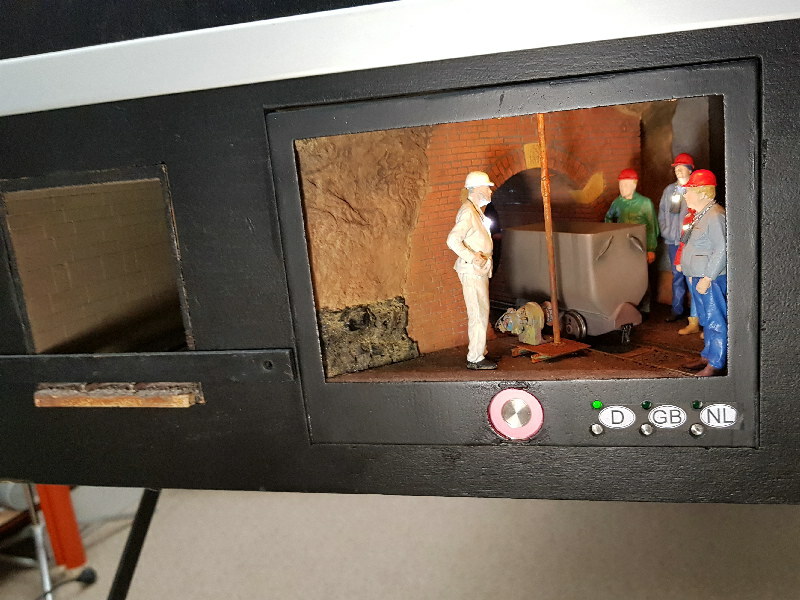 The pit lights on the figures will look good and add the the ambiance of the scene. I don't think you have a model of Volker there. Come to think of it, Volker has been absent so long maybe he was never real in the first place! Yes Volker is also missing from my model visitors, but Frithjof is there. 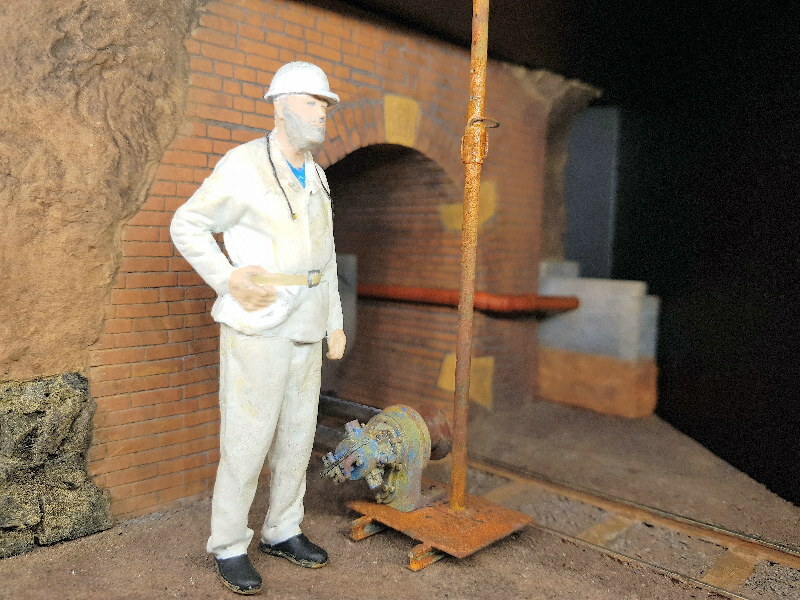 I took part in the weekend at the Arge narrow gauge EXPO in Gmünd, here my presentation. The model itself is on the cake box which I have pasted with pictures of the image and the model. 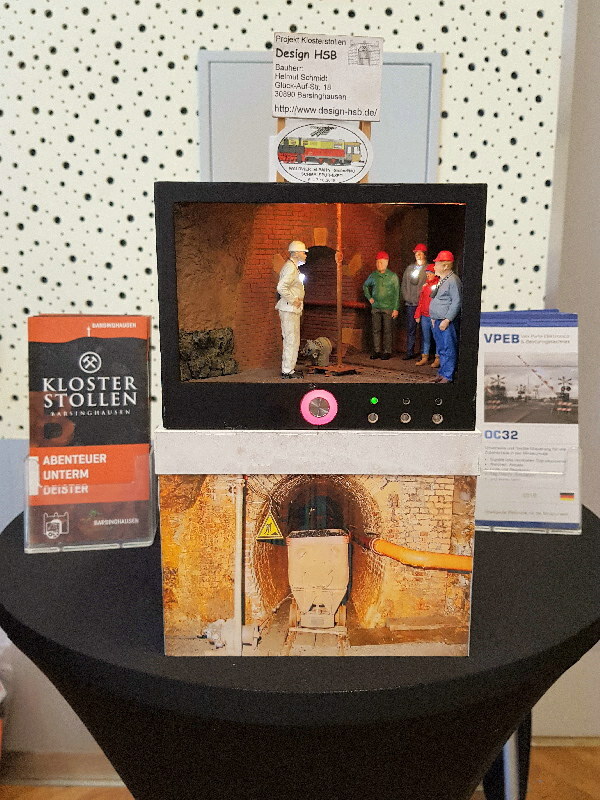 The model shows an authentic user guidance, with explanation and move of a mine car. All this was realized by 2 AVT sound modules and a Dinamo OC32 NG. 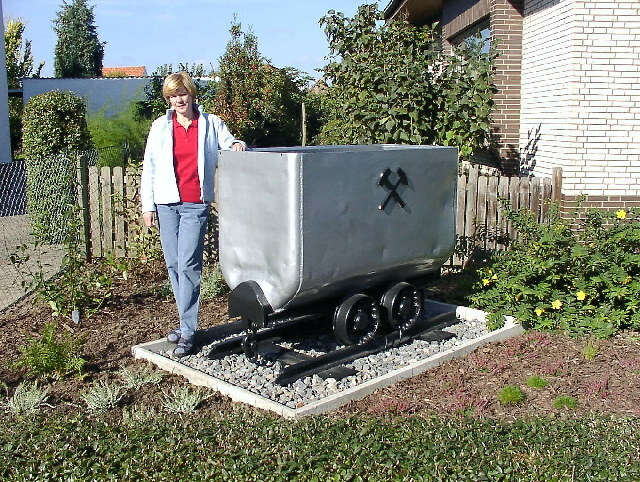 The model shows an authentic user guidance, with explanation and procedure of a mine car. All this was realized by 2 AVT sound modules and a Dinamo OC32 NG. Thats one fine group of model citizens! That is so cool! It really turned out great! My biggest win is a possible extension of my "Klosterstollen" model. And so my Cake Box has made its way into the "Klosterstollen" model. To do this, I first sawed a matching neckline into the "Klosterstollen" model. 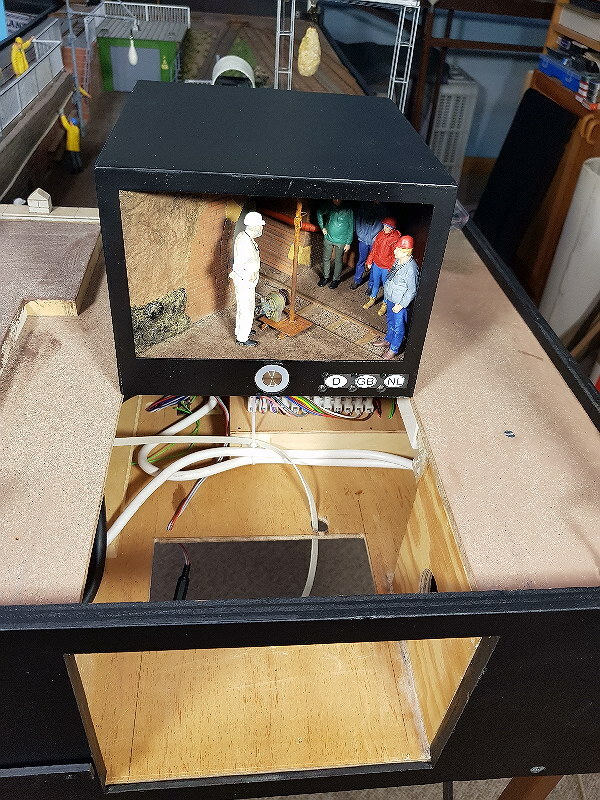 The Cake Box can be inserted into this section from the outside and, of course, electrically connected to the "Klosterstollen" model. Cool! Was that part of the plan all along, or something you decided on after making it? Ray, the construction was actually a test, for an extension where I want to show the terminal station in the mountain. A concealed fiddle yard is also supposed to be used in order to be able to change trains. Above Fiddle Yard, more boxes of scenes can then be installed. The Fiddel Yard then joins the studs and then covers the opening of the box and so I can exhibit later with or without an extension. But first there is still a lot to do at the monastery tunnel, I have just started building trees.